This Agricultural Communications test bank is made up of 81 multiple choice and true/false questions over chapter one: Communication Theory. 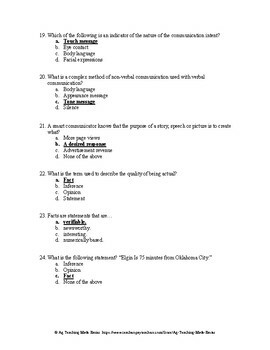 The questions were created using the Oklahoma Department of Career and Technology Education CIMC Communications in Agriculture, 2nd Edition textbook, copyright 2017. 1. Describe the listening process. 2. Discuss listening skills and the role of feedback. 3. Distinguish between verbal and non-verbal communication. 4. Discuss factors that determine audience. 5. Define fact, inference, and opinion. 6. Discuss ethics in communication.